Most manufacturers of cryotherapy chambers such as ourselves supply quality equipment. However, there are other important aspects that can make an equipment reliable and do well in the environment where it is installed. Deciding on the best location to install your cryotherapy chamber is key when laying your plans. Deciding where to place your equipment is not as easy as it may seem because there are a lot of things you have to consider. The decision made will majorly determine whether your cryotherapy business prospers or not. Apart from just finding a vacant building and turning it into a cryotherapy studio, you need to consider the following factors as well. The building where your cryo equipment will be installed is of very much importance, but it needs to be in a strategic position. It has to be easily accessible and if possible, be able to attract passers-by. If it is located within the city centre, there should be easy access to parking and if it is off the motorway, there should be a ramp nearby. As people walk or drive to your facility, they should be able to find ample parking, bike storage and footpaths. Easy accessibility will ensure smooth operation within and around the facility throughout its lifetime. It is important to begin with a workable budget. The budget will significantly impact on where you will finally set up your facility. As you decide where to place your facility, your budget will guide you and answer the questions you need answers to. Say you are thinking of whether to purchase an empty lot to build your own facility from scratch or lease an existing property. In the case of leasing, you will need a certain amount of money to do renovations. If you need money, you may need to secure loans and you have to know the amount you need to request. With a sensible budget, you will be able to decide where to locate your facility and decide whether to build or lease. Before you consider a neighbourhood, you should asses the competition you will face in that location. If the market is overrun with cryo studios that are already established but you still have to join the business, you have to come with an edge over the others to prosper. A proper research on the other cryo facilities in that location will help you determine if that region is good for your studio. Apart from the competition’s location, assess the customers’ demographics too. If your competitor focuses on middle-aged parents looking for quick boost programmes, and you are hoping to appeal to the sports community, you may still have a big chance of coexisting within the same location. You should note that narrowing down your target market – let’s say to city dwellers, retirees, middle-aged parents, etc – by age, income and lifestyle will greatly help you decide the best location for your facility. 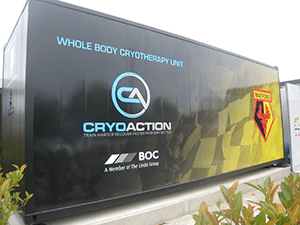 To find out more about CryoAction’s range of cryotherapy chambers, please contact us on 0800 014 8058 or fill in an enquiry form and we will get back in touch as soon as possible.